North Dakota and pheasant hunting have a long history together, with an abundance of those beautifully colored game birds in the grass-covered prairies, part of the western side of the state making pheasant hunting North Dakota excellent hunting for all. Some choice locations in that area of the state would be Bowman, Grassy Butte, Belfield, Regent, and Dickinson. Many outfitter companies also are located there to offer excellent pheasant hunting while still maintaining the preservation of the local and regional history for pheasant hunting. North Dakota and South Dakota both are idea pheasant hunting areas, with South Dakota listed as the number one choice of all hunters. Last fall, it was confirmed by the United States Department of Agriculture that the impact lands that are enrolled in the Conservation Reserve Program (CRP) actually do have an impact on the pheasant population. Since 1945-1946, the year 2002 was the first time that pheasant hunting North Dakota hunters bagged more than 500,000 pheasants. The reason for this seems to be involved in several combined factors. Mild winters in the area have a lot to do with it and also the CRP program that pays crop producers to let previously farmed land lie idle. The CRP program was originally developed to reduce erosion on highly erodible cropland. It was also developed to reduce grain surpluses for an increase in commodity prices. Since the mid-1980s, North Dakota has put way over 3.3 million acres of land into the CRP project with the total number of the CRP land as 36+ million acres, which has increased the pheasant population due to the extra grass. This natural cover has been left to grow year round as ideal nesting and cover rearing for young chicks for pheasant hunting. North Dakota winters will limit the pheasant population if it turns bad, or even drought conditions during the summer. But the CRP project has literally turned both North and South Dakota both around economically in regard to pheasant hunting and other wildlife areas, with pheasant hunting North Dakota and South Dakota qualities as high as there is throughout the country. Two recent studies, the Grassland Bird Study and the Duck Species Study, have shown us that the CRP is producing and sustaining millions of game birds in the PPR region. 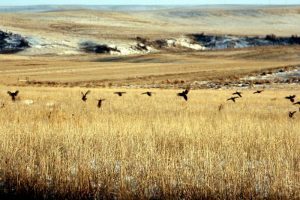 The high increase in ducks and grassland birds in the Prairie Pothole Region (PPR) of both Dakotas and northeastern Montana, has proven that the CRP goal is an extremely well-targeted and focused conservation program that is working. One of these studies, the Grassland Bird Study, has proven that without the CRP land in the Prairie Pothole Region of the Dakotas, the bird population decline would be from 2% to 52% less birds, depending on the species. 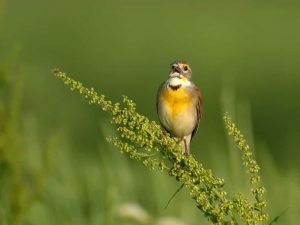 The North America grassland birds are declining more than any other bird group, with a very high rapid decline of dickcissels and grasshopper sparrows. Also, without the CRP in the PPR region, 1.1 million bobolinks and more than 319,000 sedge wrens would be gone.